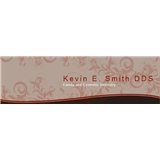 Kevin E. Smith DDS, Family & Cosmetic Dentistry (New York) - Book Appointment Online! This was my second visit with Dr. Smith, and it won't be my last. The office is clean and modern, my appointment started right on time, and Dr. Smith is professional, friendly, attentive, and takes the time to help me understand what's going on with my oral health. I feel I'm in good hands. Thanks again!